It looks like I’m someone who struggles to commit to writing favourites posts on the regular. I feel like I could go on and on about favourites and never talk about anything else. However, I have some recent favourites that I’d like to share. Viseart 10 Warm Mattes Eyeshadow Palette ($100 CDN): I never thought that I would be one to gush over an all-matte eyeshadow palette because quite honestly, they bore me to death but here I am. In terms of everyday use, I find myself always reaching for this mainly warm-toned eyeshadow palette and just reaching for a shimmery shade for the lid. It never has any fallout, has all the shades I’d need and blends and applies effortlessly. I really like all of the shades in the palette but I find myself reaching for the red shade particularly often. I’m surprisingly fond of the mustard-y shade as well. The shades do everything neutral from the most basic eye to a blown-out rusty smoky eyes. Fenty Beauty Killawatt Foil Freestyle Highlighter Duo in Sand Castle/Mint’d Mojito ($44 CDN): This cream-powder-duo highlighter was a surprise love of mine, having that kind of intense blinding quality to them and being weird highlighter shades for my moderately fair skin. The shades, however, are not chunky and apply like a metallic and iridescent glint. With a fluffier highlight brush, the pale blue applies like a slightly silvery ethereal glow (that I can even make work with my warm-undertones) and the the bronze looks more like a golden glow. They don’t highlight texture as much as I would expect – note her that I don’t pack them on excessively – and they have good longevity. I also like them as eyeshadows, paired with matte shades as they provide that gorgeous sheen to the lids without obvious shimmer chunks. Fenty Beauty Match Stix Matte Skinstick in Amber ($31 CDN): Have I ever mentioned that I actually love the contour stick from Rihanna’s line before? 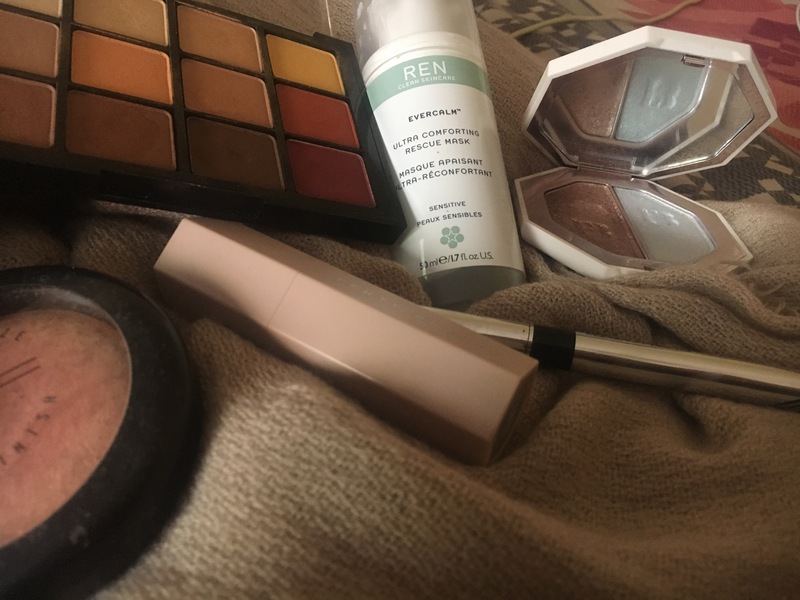 Regardless, I’ve loved it for awhile and its the perfect thing to grab for when I want some shape to my face but don’t want a bronzed look or to have to put much effort in. It’s a great cool greyish tone that isn’t too dark on my fairer skin and it sheers out nicely but can also be built up. They feel dry but I don’t have a problem blending the stick in a few seconds with a synthetic brush, even on my quite dry skin. MAC Cosmetics Mineralize Skinfinish in Stereo Rose ($39 CDN): I really struggled with the decision whether or not to feature this product in the post because Stereo Rose is a limited edition colour that they tend to only release every year or two and it’s not available at the moment. However, I adore the glowy warm pinky copper leaning coral powder as a glowy blush when I’m feeling a bit dull and need a dose of radiance and brightness. It can pull kind of orange but its flattering on my fair skin. I love the formula, as its a shimmery and sheeny one – that can be used on the cheeks as a highlighter or as a blush – without visible shimmer particles or chunkiness. I think it would even work on deeper skin tones as a true highlighter but I’ll stop now because it’s not even available! Physician’s Formula Eye Booster 2 in 1 Lash Boosting Eyeliner and Serum ($15 CDN): I hadn’t remembered how much I adored this easy-to-use brush tip liquid liner until I purchased a fresh liner. It’s my favourite for everyday use as it’s easy to create a little wing (which is my go-to everyday thing) and doesn’t require the steadiest hand in order to do so. Also, I love that it doesn’t budge or smudge but removes easily with a micellar water or cleansing balm. The thin tip is really useful for creating a wing and creating thin smooth lines.